The first 2 years the girls were born we went to San Antonio. To me it's a great place for family vacations it has plenty for adult and for children. This year we are going to New Braunfels and renting a house. definately better. One toy we discovered for traveling was a magnadoodle. They loved to color. It's easy to keep in their lap and no mess!! Hopefully this year will be even better. Hi! I'm a new follower from Twin Tuesday. Your twin daughters are beautiful! 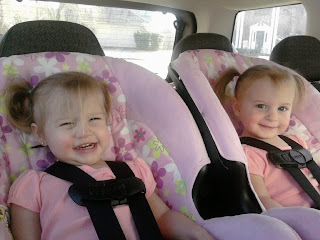 I also have twin daughters (six year old fraternals).